Bedeschi Spa, a long-time supplier of crushing and handling machines for the cement mining industry, steel factories, coal and others industrial processes, has in the latest 15 years added a new string to its bow, writes Eng. Pietro de Michieli - Chief Operating Officer Bedeschi Spa. It now also produces a wide range of shiploaders for on-shore installations. Major Bedeschi bulk cement and clinker shiploaders are already in operation, while others are in the assembly phase. Thanks to its wide experience, Bedeschi is able to offer shiploading technology even in a different kind of sector. Close to the classic technology of using a loading boom, rubber belt conveyor and telescopic chute, Bedeschi’s design uses a chain conveyor and telescopic chute to ensure a closed, sealed system that is dust-proof. Below is a case study that details shiploaders using chain conveyors and rubber belt conveyors in the fertilizer industry. In May 2012, Bedeschi was awarded a contract to supply a shiploader to Yara’s Brunsbuttel facility in Germany. The contract included turnkey delivery, including engineering, construction, erection, commissioning and start-up of a shiploader to replace the one that was already in place. The shiploader moves along the quay on a portal travelling device and receives the bulk material (urea) from the tripper car on the fixed quay gallery belt conveyor. The portal travelling device has two groups of twin wheels located on its corners and runs on rails. The upper part of the portal is equipped with one transfer chain-conveyor, receiving the material from the tripper car installed on the gallery quay conveyor, and delivering the same to the main chain conveyor installed on the boom of shiploader. The portal screw conveyor is also equipped with a cartridge filter suitable both for the ducting of transition point between tripper and the portal chain-conveyor, and to create vacuum atmosphere into the same screw conveyor. The slewing part of the shiploader consists of a rotating frame superstructure, a supporting luffing boom equipped with the main chain-conveyor and a telescopic and tilting loading chute. The telescopic and tilting chute can be equipped alternatively with a launching belt or with a loading spoon. These two accessories allow for an easy and optimal loading efficiency of both big vessels up to 20,000dwt and barges. loading chute, through two connections, functioning as and extraction system to create a vacuum atmosphere into the holds of ocean vessel. The telescopic chute is operated by a cable winch for vertical movement. The internal part of chute is equipped with dedicated lined guide cones. The totally enclosed chain-conveyor frames also help to meet the aim of environmental friendliness, as they enable significant noise reductions. Shiploading is carried out by a combination of slewing, luffing-lowering and telescoping movements. All movements are controlled from the same control cabin by means of PLC automation. The telescopic chute is an ideal solution to prevent the problem of breaking particles and to minimize dust generation when loading bulk material. The design of the telescopic chute ensures that material particles are kept in mass flow form and at low velocity. In fact the internal lining of the module cones minimize the escape of dust particles without affecting loading rates. The extraction system, represented by the top boom filters, guarantees a perfect vacuum atmosphere into the vessel hold, preventing any dust emission. Due to the minimal free-fall and the low velocity that the material experiences, greatly reduced material degradation is evident when loading sized product. Havre. The contract is EPC-based, including commissioning and startup activities. The shiploader is designed for loading at a rate up to 250tph and for vessels with a capacity up to 20,000dwt. The shiploader is a luffing and travelling type and it is equipped with the traditional belt conveyor boom. The machine will replace the current shiploader at the harbour terminal, a few kilometres away from the Le Havre Yara plant. It will become the connection point for final product export operations. Commissioning of the machine is expected to take place in the middle of 2016. This project is the third to be awarded by Yara to Bedeschi, confirming the reliability of Bedeschi machines in this field. In an ever-more globalized and competitive world, port infrastructures are rapidly changing. It is often necessary to handle bulk material far from the quarries, by sea, with ships that are becoming bigger. It looks clear that to guarantee efficiency in the ports in this changed scenario it is necessary to optimize the position and the volume of the stored material, reduce the loading/unloading times and create functional and eco-friendly terminals. This is why the modern port has to be equipped with all kinds of machines like shiploaders, conveyors, etc. to be able to complete the vessel’s loading process in the minimum time considering also dust-free solutions. Bedeschi, with its wide range of machines is able to satisfy the modern need for solutions that are flexible, efficient, eco-friendly and, last but not least, cost-effective. 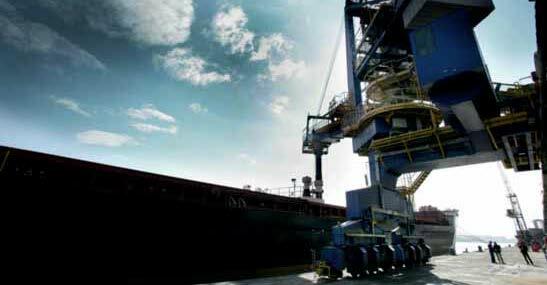 Bedeschi has many years of experience in supplying on-shore and off-shore material handling systems and extensive experience in the design of bulk material handling plants for continuous loading of dry bulk cargo onto ocean vessels up to Capesize in deep water anchorage. Each new project incorporates feedback received from the on-going systems to continually improve the design of the machines.